With 4 woodcut portraits, and 518 botanical woodcuts. First German edition of Fuchs’ celebrated herbal. 375 x 245 mm. – 444 leaves. With 2 publisher’s devices, 4 woodcut portraits, and 518 botanical woodcuts, one of which coloured. Leonhart Fuchs (1501-1566) created an herbal which marked a turning point in 16th-century botany. 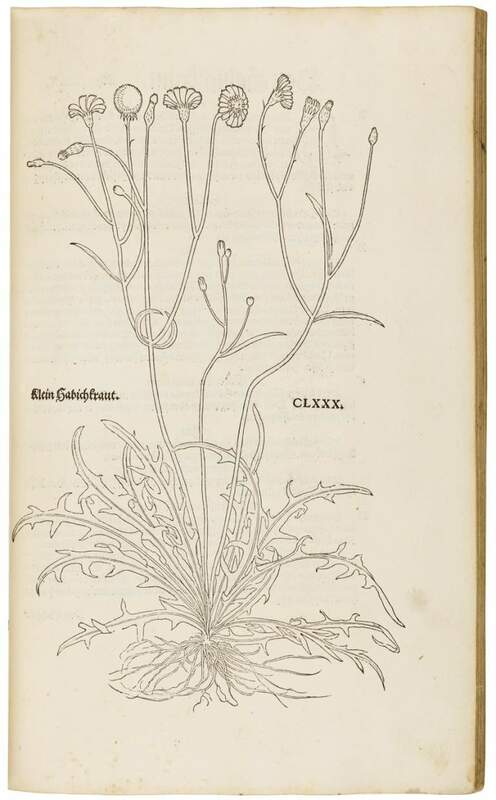 In addition to describing plants for their medical use, Fuchs also gives accurate botanical descriptions of more than 400 German and 100 foreign plants; the latter constituting the first descriptions of recently-discovered American plants, such as maize (which the author mistakenly thought originated in Turkey), pumpkin, chilli pepper, and snap bean. The present German edition is basically the equivalent of the first Latin edition from the previous year, but, as Fuchs stated in the preface, material deemed superfluous to ordinary man had been dropped, whereas descriptions had been improved and five more flowers added. The work is particularly important because of the size and beauty of the lifelike woodcuts that are both botanically accurate and striving for the memorable 'ideal form' of each plant. In some cases, the development of a plant is demonstrated in a single cut from tender bud, to flower or blossom, to fruit. One single woodcut is skilfully coloured in this copy: No. CLXXVIII, Blaw Gilgen (German Iris). Full recognition was given to the three men who created the illustrations – Heinrich Füllmaurer, Albert Meyer (draughtsmen), and Veit Rudolf Speckle (woodcutter). Their portraits appear at the end of the book, which is quite astonishing for a period without the habit of referring to a book's collaborators and artists, much less drawing and printing their portraits within the book they produced.